I’ve been holding my metaphorical tongue on this issue for some time. I am thoroughly convinced that most Americans, particularly those who hold office just don’t get it. In a number of ways. They don’t really understand the problem. And if you don’t really understand the problem you will not put together a good solution. It seems that the media & majority politicians portray the problems as 1. insurance companies and 2. Republicans. Here are some of the problems that need to be addressed, but don’t seem to even be mentioned. Health Care Providers. Often they are concerned about their bottom line, and not your wallet or your health. As a result, tests are repeated instead of examining the results from just an hour ago. I’ve seen it in my job in health care. The patient goes from the ER to the main floors and all kinds of tests are repeated. It is as if the tests done in the ER didn’t occur. Well, the patient wishes they didn’t because they have to pay for them. One contributing factor is health insurance providers who pay according to the test, not knowledge & expertise. But it is also the health care providers who want to pay off their MRI instead of the one at the other hospital you went to last week. Health care providers also do not have a fixed rate for services. Often they are re-priced so the people who can least afford to pay more actually do. Of course there are irresponsible people who don’t pay their bills, and the health care providers recoup the losses by charging responsible people more. Drug Companies. They now advertise convincing an unenlightened populace that they have a problem that can only be solved by medication. The use of these new drugs drives up costs, and therefore the cost of insurance. They seem to be in cahoots with the medical establishment which keeps changing the “normal” results for blood pressure, cholesterol, etc. I assume most of you just went “who?”. No, he’s not a theologian or a sports figure. He’s a Florida politician who is gunning for Mel Martinez’ (who was a bit of a disappointment as a Senator) vacated Senate seat. FL. Gov. Charlie Crist has set his sights on that same seat. They are in the same party. One is clear about where he stands, the other has a record of standing in too many places on too many issues. Rubio has begun to gain name recognition in Florida. And beyond. He is a real conservative option for the mid-term elections. Unlike Crist, he really is a conservative politician. Here is an interview from the American Spectator. When I was offered the opportunity to read and review Christianish by Mark Steele, it looked very interesting to me. 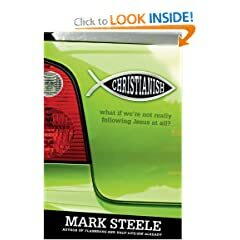 The subtitle is “What if we’re not really following Jesus?” I am not familiar with Mark Steele, but the subject interested me. Mark Steele is a pretty funny guy who can tell a story. In many ways this is similar to Donald Miller’s best work (in my opinion, Blue Like Jazz and Searching for God Knows What). He uses rather lengthy stories to introduce the topic of the chapter. He has some important things to say. There are a number great thoughts for the American church to consider. There are many ways in which we truly are not following Jesus, and Mark identifies a great deal of them. These things make the book accessible to broad evangelicalism. The problem is that Mark never really gets to the core issue. He never even really defines Christianish, but leaves it as fairly obvious. Each chapter addresses one aspect of what he thinks is Christianish and how we should be instead, but he never gets around to defining the problem of what I call nominal Christianity, or cultural Christianity. Some great thinkers like Jonathan Edwards (Charity and Its Fruits) and Dietrich Bonhoeffer (The Cost of Discipleship). In those books, Edwards calls the problem counterfeit grace and Bonhoeffer cheap grace. Steele’s perspective would have been deepened from spending time with these men, applying their thoughts to our generation. This, in fact, is what seems to separate Donald Miller from Mark Steele. Miller subtly comes off as well read. Since Mark does not adequately identify the problem, he completely misses the cure. It basically sounds like try harder, try differently. It could be imagined that he is talking about repentance without clearly talking about repentance. You get a sense similar to what I thought of MacArthur’s The Gospel According to Jesus after talking about it in class with Jerry Bridges. Much of what John MacArthur says is true, but he neglects the doctrine of regeneration which gets to the core of the issue. John Piper’s recent book, Finally Alive, is essentially addressing the same issues as Mark Steele’s. Not as hip, to be certain. But he gets to the core problem & cure: lack of regeneration & believing (and savoring) the gospel. I think this is part of the problem with broadly evangelical books- they lack a depth of theology and saturation with Scripture. I am aware that this sounds harsh. I enjoyed reading Mark Steele’s book. I just didn’t find it helpful in combating the remnants of Christianish in me, or others. And address it we must. Update: Yes, that was pulled. But here are some other things on the subject. I must confess that I have never read an Alister McGrath book, until now. 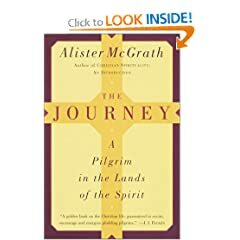 Three years ago a friend recommended The Journey: A Pilgrim in the Lands of the Spirit while I was on one of my journeys to the RTS Orlando Bookstore for a sale. At some point I started to read it, but got stuck along the way. Fast forward to my trip to PA earlier this month. Seemed like a good book to bring. I’m wondering why I put it down in the first place. It was very appropriate for the place in life where I find myself. Alister McGrath confesses that it is too easy for him to intellectualize his faith. Here he is not advocating an anti-intellectualized faith, but internalizing the truth of our faith so it produces hope in the midst of life’s journey. To do this he spends some time advocating biblical meditation (see my post on this). This is part of the map he provides for us to persevere on the journey. He takes Exodus as his template with alternating stages of wilderness and oasis. To promote trust and hope in the midst of the suffering that will often mark this journey, he talks about remembering what God has done and anticipating what God will do. These are essentially the past and future aspects of biblical meditation. Along the way the introduces a series of landmarks from a biblical theology (creation, fall, redemption), and some companions for the journey. He recognizes the need to learn from those who have gone before us. He chooses men like Jonathan Edwards, J.I. Packer, C.S. Lewis, John Bunyan and more. It was CavWife’s birthday, so a plan was formed. Disney offers you free admission on your birthday (I hear this plan will come to an end soon). We had a friend who works for Disney able to sign the rest of us in. It was a great way to spend the day together, affordably. Best of all, it was October and temperatures would be more tolerable. Little did we know, when making these plans, that her birthday would be smack dab in the middle of a record-breaking heat wave in Central Florida. The Happiest Place on Earth became … the Hottest Place on Earth. We met our friend who whisked us into the parking lot, free of charge. We didn’t bring one of our strollers because she could also get us a double stroller, free of charge. This was looking better every minute. The only money we had to spend was on food. We made our way through Main Street USA toward Fantasy Land, little realizing we would nearly be trapped there the entire day. Going to Disney with 2 pre-schoolers is, well, different. Everything takes 3 times longer, and there are suddenly rides you never even considered waiting in line to get on. There are rides you really want to ride that you will never see all day. We started off on the Merry-Go-Round. CavSon was not too excited at first, but warmed up to it. From there we could see Dumbo, and at first CavGirl wanted to go. But that all changed. We would get used to this. We watched Mickey’s Philharmagic, a 3-D show (when it is really hot, you take advantage of these moments in the A/C). CavSon really didn’t like it when anything came toward him. CavGirl was reaching for the floating jewels, which was priceless. Then off to Small World, Peter Pan’s Flight. While waiting for our fast track time to come, we made a short venture to Tomorrowland hoping that I could ride Space Mountain. Those hopes were dashed like an egg tossed off a cliff- closed until Winter 2009. So it was Monster Inc.’s Laughing Floor instead. It was on the way back that CavGirl decided riding Dumbo would be fun afterall. Joy of all joys, the line had doubled. CavWife bailed on us (birthdays have their privileges), missing a monumental tantrum by the boy in line ahead of us. She also missed the guy in front of us, who must have had a gallon of water ooze from his pores while waiting for Dumbo. And then there was the Muslim family wearing half a store in the sweltering 90+, feels like 100+, temperatures. Too often we hear about selfish agendas, monuments to egos and other disgraceful things when churches make the news. It is the bad stuff, the proof that we really need a Savior. Rarely do you hear the news that proves that the Savior lives and changes people- news about sacrifice for others, dying to self so that others might benefit. Winter Haven is “splant” central. It is notorious for bitterness and selfish ambition resulting in new churches split off from existing churches to serve self more than Jesus. One of my friends was pastor of an aging, struggling church. Closure seemed inevitable. What to do with the property? When our church closed we were tempted to sell our assets to other congregations. But we decided to make them available to other churches, especially church plants, free of charge. My friend had an even better idea- they just gave their facility to a new church plant. They wanted to see the facility used to further the kingdom. It wasn’t about money, but the kingdom. It was about leaving an inheritance, so to speak, for the next generation. Here is more. In the midst of all the stories you hear about how horribly Christians can treat each other, doesn’t this one give you hope? It does me, and I need that right about now.